Rattling around in the back of my brain is my mother’s admonition never to discuss, in polite conversation, either politics or religion. Lately, though, these two subjects have been eating up the media airwaves, sucking up all the oxygen in the universe (it feels like), and besieging news readers and concerned citizens with heartbreaking reports and dire warnings. Just think: the Pope’s Easter message of love and brotherhood (“We are all children of the same God,” he said when he washed and kissed the feet of Muslims and Hindus this holy week) seems to be falling on deaf ears, while the hateful, hate-filled presidential hopeful Donald Trump is bamboozling multitudes of sheep-like Americans, including so-called Christians, into following him. It’s been getting me down. But rather than discuss any of this now, since I prefer to think of my WOW Factor blog as a polite conversation and not a political or religious polemic, I’ll choose a lighter, brighter, happier subject for this post: balloons. 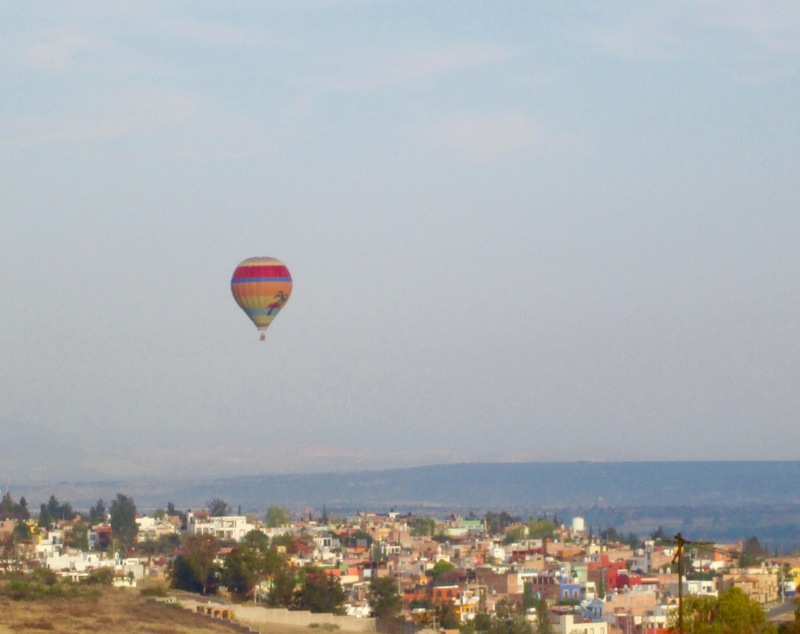 Nearly every morning in clear weather here in San Miguel de Allende, Mexico, just as the sun is rising and I open my bedroom curtains, I can see out to the right, in the distance, one or two big, beautiful, colorful hot air balloons floating placidly in the pale blue dawn. This is a lovely way to start the day, I’ve found. It lifts the spirits. As an earthbound Earthling Earth-sign (Taurus) who clomps through life wearing cement shoes and wouldn’t be caught dead taking a ride in the wicker-basket gondola of a hot air balloon, I rush up to my rooftop terrace and gaze in amazement at the sight of this airborne wonder. Imagine floating like that in the sky, I think, feeling above it all, care-less, weightless – just for fun (not flying from Point A to Point B in a jet). To prove to myself that I’m not still asleep and dreaming, I take pictures. 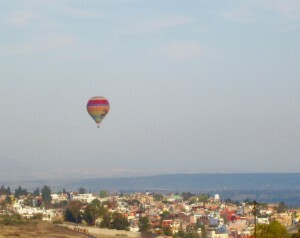 This morning’s hot air balloon sighting made me wonder: Who invented this thing and when? What is the hot air balloon story? I learned (thanks to Google, of course) that the hot air balloon is the first successful human-carrying flight technology. In September 1783 a French scientist by the name of Jean-Francois Pilatre de Rozier launched the first hot air balloon flight using animals as passengers – a sheep, a duck, and a rooster. That balloon stayed in the air for a grand total of 15 minutes before crashing back to the ground. But just two months later, de Rozier had more success: The first untethered manned hot air balloon flight was performed on November 21, 1783, in Paris, France. In the United States the first hot-air balloon was launched from the Walnut Street Jail in Philadelphia on January 9, 1793, by the French aeronaut Jean Pierre Blanchard. 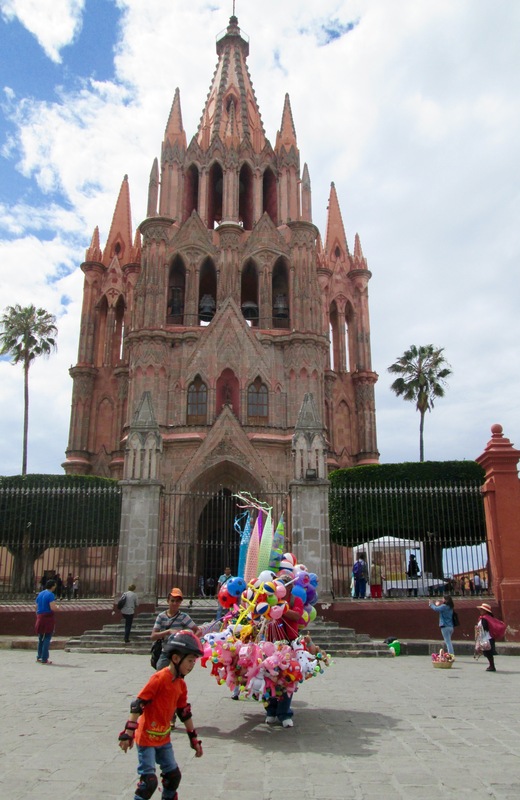 Today there are over one hundred hot air balloon festivals held throughout the world. The International Balloon Fiesta celebrated each October in Albuquerque, New Mexico, is one of the largest. the air inside. And that is leaking.